A common problem is how to get rid of an old tattoo. An alternative to laser tattoo removal is cover up tattoo. This means you get a new tattoo design over the unwanted one. The process of tattoo cover up is not as easy as it sounds. You cannot expect a perfect coverage in most tattoos. On close inspection, it is quite common to see a little indication of the old tattoo behind the new one. The same is true for laser tattoo removal in which the old tattoo will still be slightly visible despite numerous laser treatments. This is the main reason why getting a tattoo must not be a spur of the moment decision. It requires extensive planning and preparation as well as envisioning how you would feel about your ink decades later. 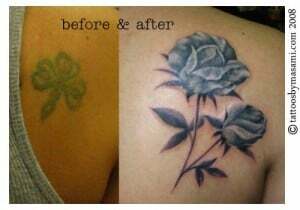 To have a successful tattoo cover up, you should have the new design custom made to ensure maximum cover. Flash tattoos would not work well for this purpose. Black is the best colour to use when covering up an old tattoo. Other suitable shades are dark blue, purple, and green. Cover ups that work best are those with lots of coverage and have a solid design. Avoid shades of red, yellow, and orange unless the tattoo artist is exceptionally skilled at disguising old tats. It is said that that the new tat design should be two to three times the size of the original design. This means that it would require a longer tattoo session and also a longer healing time. It is generally cheaper to get a cover up tattoo instead of going through laser tattoo removal. Thus, the cost of the cover up should be the least of your concerns. Expect that highly trained tattoo artists would charge more because of the quality of the work done. One of the worst mistakes that you can make is going to non professionals. Research and plan carefully so your cover up tattoo will finally be well worth the time, money, and effort.